A new concept is born for owners that favour the aft cabin yachts, with the recent newbuild of the Jetten 65 by Jetten Shipyard. This new yacht design, featuring a Cor D. Rover design, focuses on the maximum sailing comfort featuring Van Oossanen’s Fast Displacement Hull and a Hull Vane®. The Jetten 65 can be seen as the new ‘aft cabin yacht’ standard, a type of yacht particularly appreciated by Dutch, British and German yacht owners. 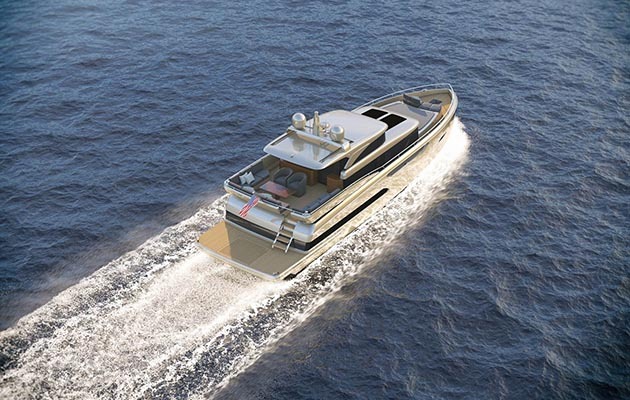 The design of Cor D. Rover gives this concept a brand new future, providing maximum comfort onboard for the owners by her open living space, a highly comfortable VIP cabin in the front and in the aft the owner’s cab with panorama view. Maximum performance and comfort is guaranteed by Van Oossanen’s patented Fast Displacement Hull Form (FDHF), allowing the yacht, featuring two 550 HP Cummins engines, to reach 20 knots – giving her owners the best fuel efficiency and sailing comfort. Being responsible for the complete naval architecture, Van Oossanen also delivered the engineering and the cutting files package of this full aluminium yacht, of which the building process has started in June. Apart from 10% fuel savings at the yacht’s cruising speed, the Hull Vane® also reduces the pitch motions of the yacht, making her a real explorer companion for yacht owners looking for the highest levels of onboard comfort. To indicate the benefits of applying Hull Vane®, Van Oossanen simulated the yacht design in the maximum wave conditions typically encountered on the Dutch inland waters, with the help of computational fluid dynamics. This resulted in over 7% less heave motions, 13% less pitching, over 10% less vertical accelerations of the aft deck, and an overall reduction of resistance of almost 11%. The build started in June 2016, follow us to stay updated on the progress of the building process.